(GAMEWEEK 4) at Old Trafford, Manchester. MANCHESTER - David Moyes got his first home win as Manchester United manager as the Champions prevailed over Crystal Palace. Wayne Rooney was sporting a headband in a somewhat comical look as he protected his head injury that ruled him out of England's games during the International break. Upon the referee's whistle, The Red Devils would swiftly get on the front foot at Old Trafford with a flurry of offense concluding in a corner which fell easily to the hands of Julian Speroni. Robin van Persie was making a lot of noise as the game started, although he and his team were unable to strike early in front of the home crowd. An excellent series of play between Fabio and Valencia ended up in a penalty appeal from Patrice Evra - although it was waved off. The Frenchman seemed to go down rather easily, and a good call from the referee. The majority of the first twenty minutes was swaying in the Champions' favor. They kept a decisive grip of the game although not posing any serious threats to that point in time. Something of the usual one may presume, as Ashley Young dived again in desperation seemingly. But in all honesty, he seemed more desperate for when he got the first booking of the game. The Visitors really had to defend hard as the first quarter of the match was passed. United found their rhythm but were kept at bay by the Eagles. 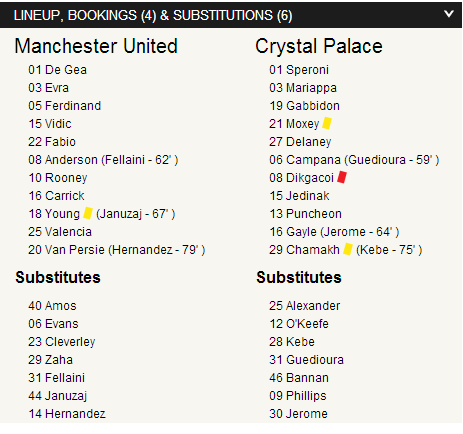 Both Robin van Persie and Wayne Rooney showing good signs, right up until goal where they leave Speroni unfazed. The home side took to another level as they continued to press, but despite all the good play there were no legitimate chances. Palace seemed comfortable on the defense but as the first half neared it's end, a few disastrous minutes had Holloway's side in turmoil. 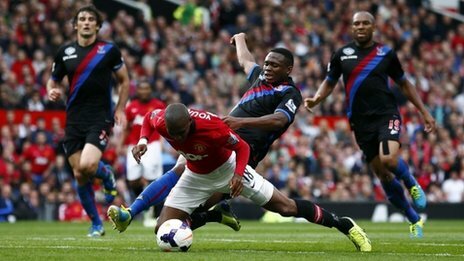 Ashley Young was taken down in the box by Kagisho Dikgacoi in the box just minutes before half-time. A small delay before the referee ruled the penalty, and sent off Dikgacoi. Robin van Persie stepped up and drilled it into the bottom left corner to give United the lead. Was it a penalty though? The referee seemed to make a guess, judging by where he was standing. Ashley Young may have indeed deceived referee John Moss. The pivotal goal and sending off in the pivotal time. Complexion of the whole game completely changed with van Persie's goal and the sending off. All at the time when it was going quite well for Holloway's side. Was it Game Over? Hard work pays off? Seemingly not for the Eagles. Having worked their socks off to keep United at bay, it is the most of unfortunate that controversy may have ruined the game for Crystal Palace. First half down, but how would Palace try to revive themselves? The Visitors got the proceedings underway at the start of the second half. They once again began on the backfoot with Manchester United giving them a little more to work on. Crystal Palace did not give up though, continuing to try and get the equalizer - or at least limit any further damage to a minimum. Things went to a more even standpoint as the hour mark approached. Fellaini made his debut for Manchester United in front of a welcoming home crowd. The Belgian replaced Anderson who really seemed unapparent during the match. 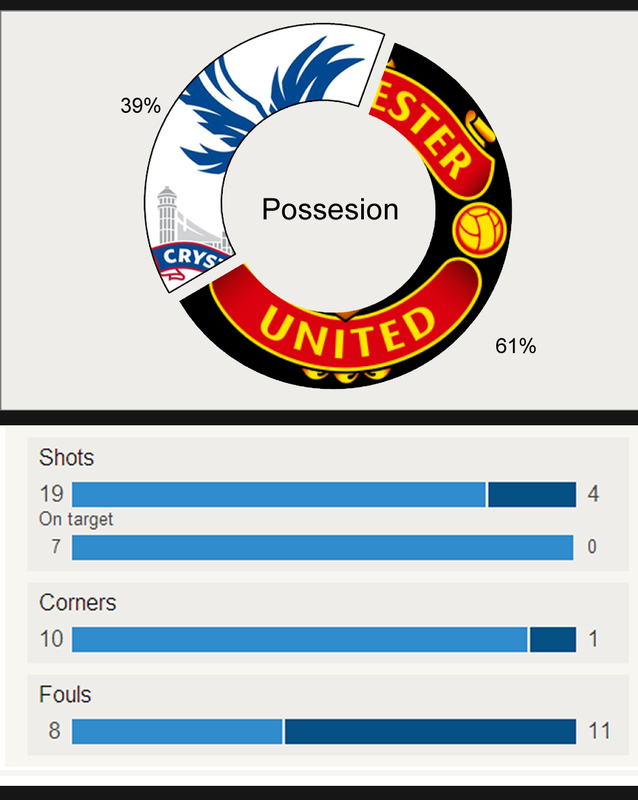 Fellaini made his first shot a good one as it tested Speroni when he chested it down and took a long-range shot. The game followed a formulaic stand for the remainder, as Crystal Palace had to defend Speroni's goal time and time again from an onslaught by the Red Devils. Manchester United relaxed for the remainder, a great performance by van Persie was capped off when he was subbed off for Hernandez. Also, Januzaj took to the pitch in replacement for Ashley Young. Wayne Rooney stepped up in the 81st minute to a free-kick. 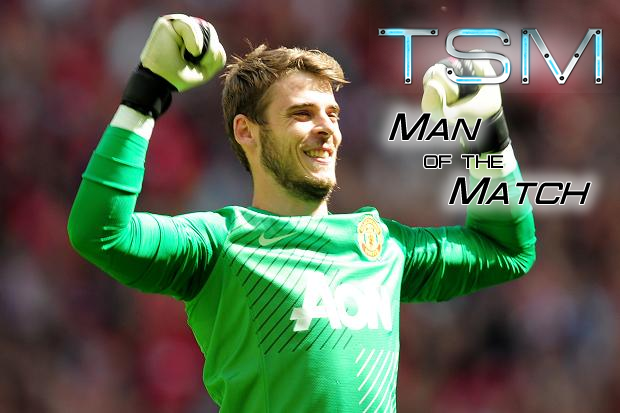 He curled it into the bottom corner to seal the three points for Manchester United. Huge encouragement for the team and for Rooney. And the final whistle blew. United win 2 - 0, and the crisis may be considered over. The Eagles were staying put against Manchester United and managed to keep them at bay. But when Dikgacoi fouled Ashley Young it was a definite red card if the penalty was ruled. From then on, it was set to be damage limitation for the Eagles. Wayne Rooney and Robin van Persie looked pretty good as a striking duo. In the first half they had their chances - although none too legitimate - but both seemed content with one another, and that's a good thing for the Champion. If a penalty was given, then the red card should have been given. But let's take a few steps back here, should it have even been a penalty. Take a look at the referee's positioning, he must have guessed that it was a penalty. Maybe Dikgacoi should not have been sent off... but Ashley Young should have! He ran straight towards the defender leaving Dikgacoi nowhere to go, maybe Young himself should have received a double-booking and been sent off. Ashley Young seemed to be throwing himself around like a ragdoll, especially in the first half. The winger seemed to be diving about and managed to deceive the referee for the penalty. DID JOHN MOSS RUIN THE GAME? Referee John Moss may be blamed by a few for the wrong penalty decision. In essence, that call may have ruined the game. But then again, he only has one look at it, so we couldn't do any beter. Wayne Rooney's free kick makes a bold statement going forward. A real uplifting goal for Rooney and Manchester United. Free kicks are going to be something fundamental for United. With Fellaini, Rooney among others being able to really nail free-kicks, it can be a lethal weapon going forward. More uplifts for Moyes. Albeit over a promoted site, Moyes has won at Old Trafford, some relief, but it was a win expected. The biggest questions from the game. Sound off in the comments below, or Tweet Us using the hashtag #TSMChat. Was it really a penalty for Manchester United, or another dive from Ashley Young? Had it not been the penalty and sending off, how would you rate Palace's chances of winning the game? Who should have got the red card? Dikgacoi, or Ashley Young receiving a second booking for a dive, or was it even a dive? Did John Moss ruin the game? Or was his decision correct? Is the van Persie and Wayne Rooney combination a long-term solution for United? Uplifting win for Manchester United. Crystal Palace may feel some injustice, but it was a decent performance nonetheless by the Champions. We could talk about the penalty decision all day, but the fact of the matter is that is how it goes. Entertaining game, hopefully the controversy is not a regular occurrence. United still have work to do though. It may be that the first goal was controversial, but take nothing away from the second. Manchester United pick up three points with David Moyes first home win, and the Champions replenish their quest to retain. MATCH COVERAGE, RESULTS, FROM MANCHESTER UNITED VS. CRYSTAL PALACE IN GAMEWEEK 4 OF THE 2013-14 PREMIER LEAGUE SEASON.